The apartment of about 90 square meters is located in a beautiful ancient village with swimming pool and tennis court. Private outdoor courtyard equipped with every comfort: pergola with sitting area, breakfast corner, solarium with 2 cushions, 2 deckchairs and sunshade and solar shower. 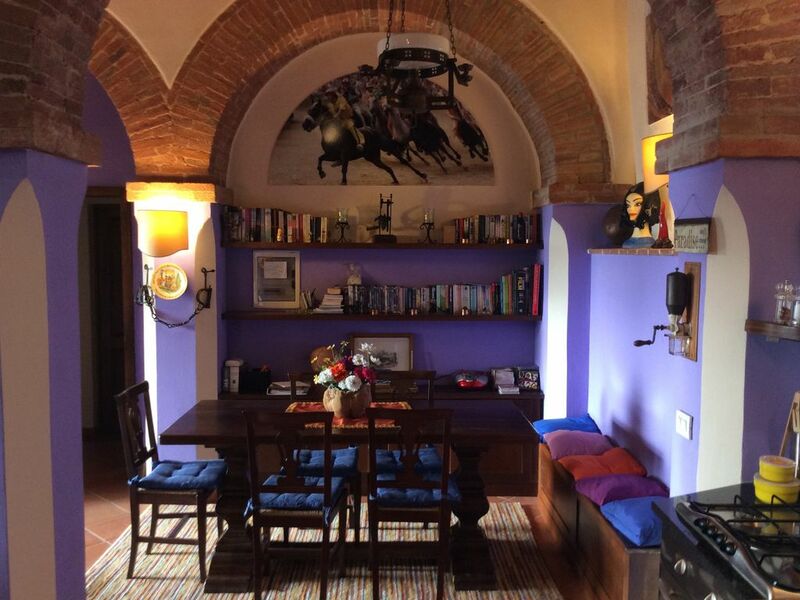 The very suggestive apartment in the structure for the presence of six brick arches is furnished with taste and originality.2 bedrooms, one double bedroom with en suite bathroom. the other with two single beds and a bathroom outside the room. Equipped with all the comforts: satellite TV, wi-fi, heating. The kitchen is complete with all accessories. Washing machine and dryer in a separate room outside the apartment. Wifi (20e / w) and heating (5e mcubo gpl) are extra. The swimming pool and the tennis court are condominium and open access. The pool is furnished with sun loungers and parasols. The tennis court has a brand new synthetic turf; available in the apartment 4 tennis rackets-no balls. Pretaccione village where the apartment 'located and' a village nestled in the magnificent Sienese countryside surrounded by vineyards, olive groves and woods. Is 12 km from Siena and 50 from Florence, 60 from Arezzo 100 from Perugia beautiful city 'of Renaissance art. Just 2 km is located the Parco Delle Pievasciata sculptures home to an important collection of contemporary art installations by artists from 5 continents. The Chianti region and 'rich in historical cellars of great value also where and' can take guided tours (Ama-Villa Dievole-Brolio Castle) Meleto Castle Castle-sampling the products. International cycling race in the style of 50 in Gaiole that annually attracts participants from around the world.